George attempts to secure a loan from Potter based on his life insurance policy. He says it has a $15,000 face value and a $500 cash value. Why is his life insurance policy worth cash? George could have cashed out the policy and received $500. But he was, as he says, “worth more dead than alive” since his family could get $15,000 if he died. But would the insurance company have paid if George committed suicide? Maybe so. Many policies have a “suicide clause” which states that no death benefit will be paid if the insured commits suicide within two years of taking out a policy. If George had the policy for more than two years (which is likely since it was worth $500) his family would have received the full benefit. 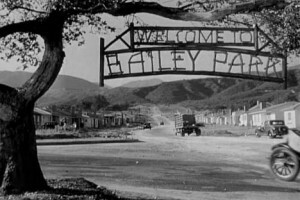 The primary legacy of the Bailey Bros. Building and Loan is Bailey Park, a housing subdivision that Mr. Potter’s crony refers to as, “Dozens of the prettiest little homes you ever saw.” This section of houses on the outskirts of town seems to be the main buffer than prevents Bedford Falls from turning into the dystopian vision of Pottersville. But how exactly does it do that? By helping the residents create wealth. Bailey Park provided the customers not only the ability to afford a home of their home, but also provided them a a form of forced savings. By paying monthly principal payments on a mortgage, the homeowner accumulates equity in a valuable asset (the home) that can later be resold or used as collateral for a loan. Since the residents of Bailey Park got the mortgage through the Building and Loan, they likely paid a relatively low interest rate, allowing them to accumulate equity relatively quickly since their monthly payments would primarily go to paying principal rather than interest. They also benefit from appreciation on their asset (i.e., the house). And that’s just what happened to the house in Bailey Park. As Potter’s crony, Mr. Reinman says, “Every one of these homes is worth twice what it cost the Building and Loan to build.” If they buy the house for $5,000 and it appreciates in value to $10,000 they could sell the house, pay off the loan, and pocket the rest of the money. Bailey Park also took money out of the hands of Potter since, as Reinman points out, “Ninety per cent [of Bailey Park homes are] owned by suckers who used to pay rent to you.” When they lived in Potter’s Field, they were likely paying rent that was equal to what they paid on mortgage in Bailey Park. Since most of the people are working class or poorer, they likely didn’t have much additional disposable income that could go toward savings. The forced savings of homeownership was the main way they increased their wealth, improved their living standards, and raised the economic prospects of Bedford Falls. But the B&L also had an indirect effect in preventing Bedford Falls from turning into Pottersville. As Potter says, he took control of many business in the area during the panic of the depression. If it hadn’t been for the B&L, people like Mr. Gower, the pharmacist, and Giuseppe Martini, the bar owner, would have likely lost their businesses to Potter. By helping to create wealth that was distributed broadly among the citizens, the Bailey Bros. Building and Loan benefited the entire community.